This summer, Stila has relaunched their Stay All Day foundation. The formula itself stayed the same, but they have repackaged the bottle into an easier center dispensing dish. 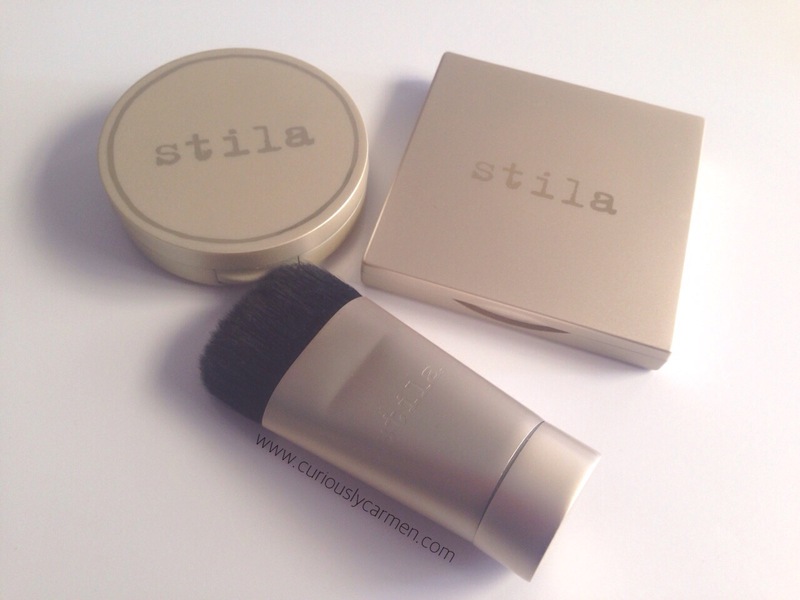 The previous packaging featured a mini scoop, which Stila decided was a bit too messy. To use the foundation, you simply press lightly on the center plate. Product will come out afterwards in a neat circle, which makes it sanitary as well. Since the bottle is opaque and you’re unable to see the shade, there is a ‘window’ on the side of the bottle in which you can see the shade. 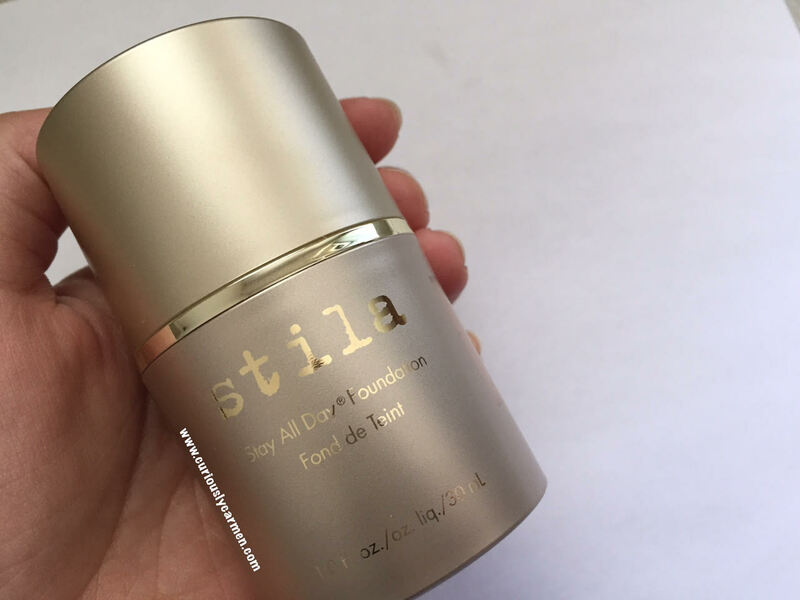 My first impression of the foundation was that I really liked it. I loved the medium coverage and the slightly dewy and sheen finish as you can see in the photo above. Although, the description says it is a matte finish, it was on the dewy side for me. The foundation really smoothed out my skin tone and it still looks pretty natural. However, after wearing it a few more times after, I’ve noticed that this foundation does not like to be used in conjunction with other facial products. When wearing this foundation with primer and setting powder as I always do, this foundation looked cakey, dry, and flakey, instead of the nice dewy finish I was used to. When I wore this foundation again on its own again, I did not have a problem with it being flaky. So, I would only recommend using this product with moisturizer only and no other foundations. I’m glad that this foundation is long lasting even without primer. I really love this foundation and it will be using it as one of my regulars in the future! I’m curious to see if others with combination skin like myself, or other skin types, found that this foundation didn’t mix well with primers and finishing powder foundations? Let me know! Media samples featured. Opinions are own. When Maki went to Taiwan and Hong Kong last month, she came back with an assortments of gifts and souvenirs for me! Thank you, Maki, if you’re reading this! Most of the items she gave me were beauty related of course, she knows me too well. I don’t buy many Asian beauty brands, but to my knowledge, I believe that they are a lot cheaper in Asia so it is a good time to stock up on them while you are there. I received a bunch of facial masks from her, which I am slowly trying out.. as well as an liquid eyeliner that I really love! 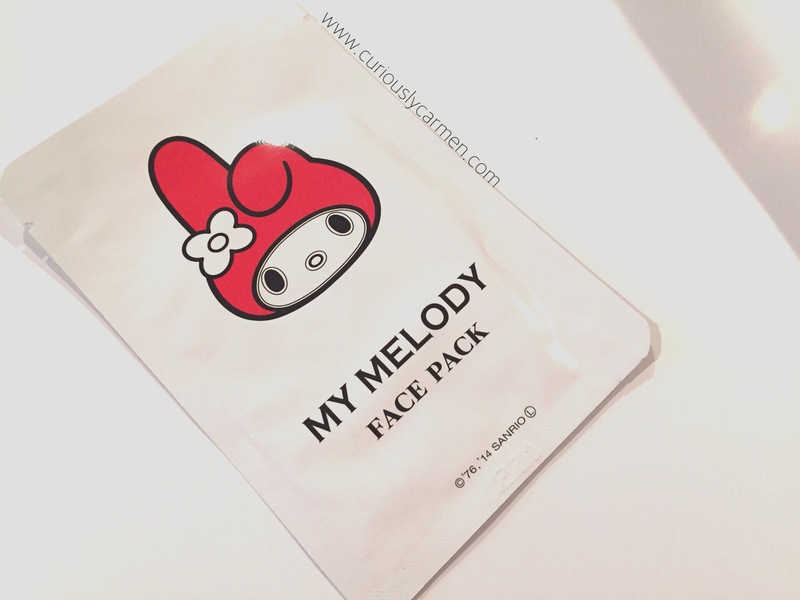 One of the facial masks that she got me was the My Melody face mask. For those of you that don’t know, My Melody is one of the Sanrio characters. You can think of Sanrio as the Disney of Japan… their characters are very popular and everywhere in Asia! The most popular Sanrio character is probably Hello Kitty. I grew up with a lot of Sanrio characters in my life, my favourite characters would have to be Hello Kitty, Keroppi, Little Twin Stars, My Melody… and the list goes on. I’m feeling so nostalic as I type this, I had Keroppi stickers all over my room and door when I was a kid! This is what the packaging looks like – simple and minimalist, yet still very cute! Although I took a Japanese beginners class three years ago, sadly I did not continue with it although I hope to be able to read fluent Japanese one day. That, or be able to travel to Japan and understand or get around! 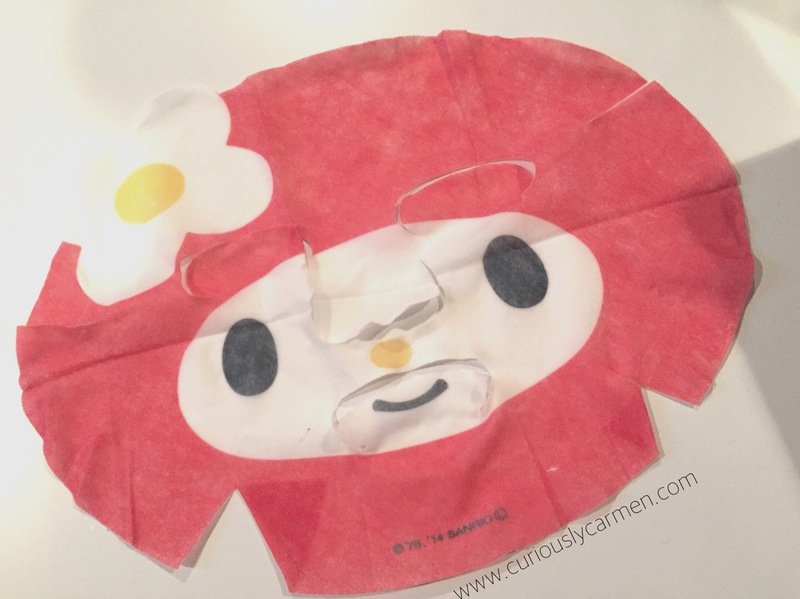 I was very surprised when I took out the mask, and saw that it was an actual My Melody face! How cute is that?! Seriously, Japanese products are amazing and are so detailed. It also smelled like strawberries, which was an excellent delight! I was a bit confused as to if this mask would fit my entire face, since it is more horizontal than vertical. It actually covered my whole face area, except for the tip of my nose because the nose flap was a bit too short for me. Overall, I thought that this mask was very cute and I enjoyed using it. I really loved the packaging and design of this. 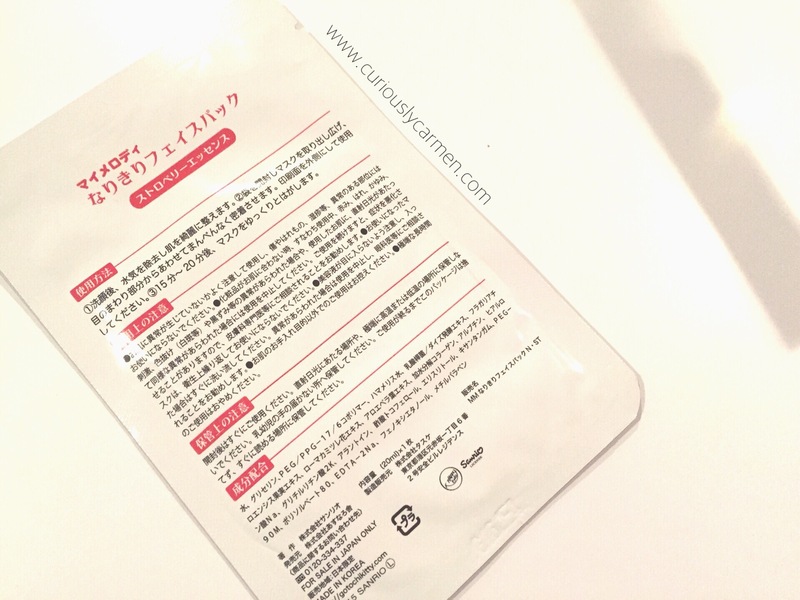 The mask felt very moisturizing, although I wish I could read Japanese so I can tell what this mask targets! Following the fall/holiday event I attended for Stila, I was generously given a few samples of their new products to try out! I’ve mentioned the ‘perfectly poreless’ line briefly on my event recap post but today, I will be doing a more detailed review after using the three products for almost a month now. 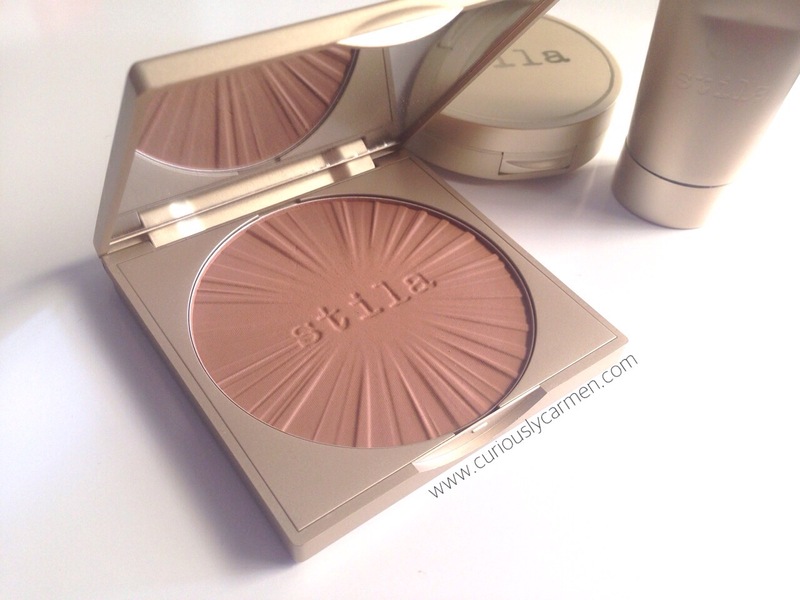 I was first introduced to this line by Sarah Lucero, the Global Executive Director of Creative Artistry at Stila who led us through all the new products that day. The products I will be reviewing today are seen on the far left of this photo! Sarah actually designed one of the products that I will be talking about! Keep reading to find out which one it is! Starting off with the new Wonder Brush, I really liked this brush at the event and was quite happy to see it in my sample bag once I got home! As the name suggests, the Wonder Brush is a versatile brush, which you can use for a multitude of different foundation steps. It was also designed by Sarah herself – how cool is that?! I liked how dense and soft the brush was. I wish that it came with a cap so that I could bring this around in my purse for touch-ups though! 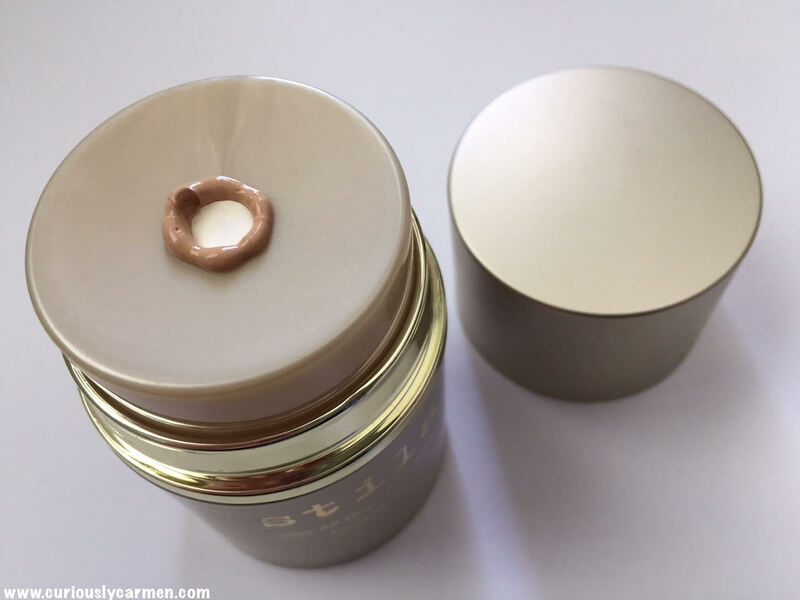 Secondly, is the perfectly poreless putty perfector! 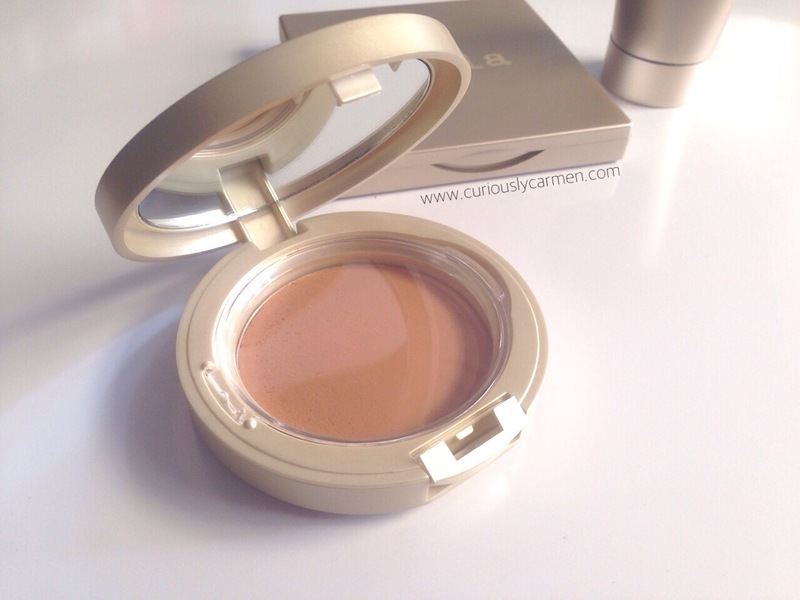 This product is a combination of a cream foundation and loose powder. The best way to describe this product would be ‘bouncy’ but also slightly more dense due to the cream ingredients in it. Although it feels very bouncy and slightly dense, the product does go on lightly and is very smooth to the touch. I was quite surprised at how lightweight the product felt, considering that it felt and looked pretty dense in the case! Thirdly is the Stay All Day face and body bronzer’. You might be familiar with the Stay All Day liquid liner from Stila, which I really love! This bronzer is an addition that line. 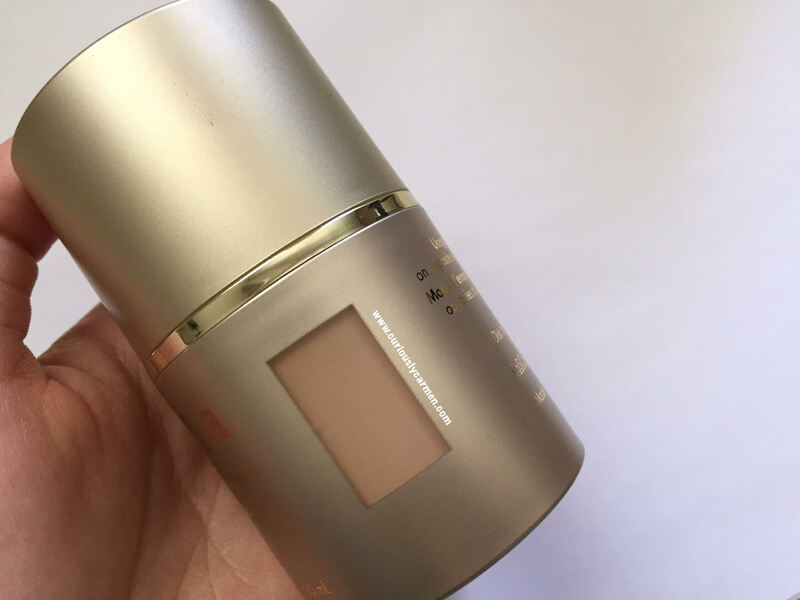 I really love the detailing of the product and how both foundations can be easily brought on the go. Both feature a mirror inside, and feel very sturdy so you don’t have to worry about the product accidentally opening in your purse or cracking! I used the Wonder Brush to apply my foundation. 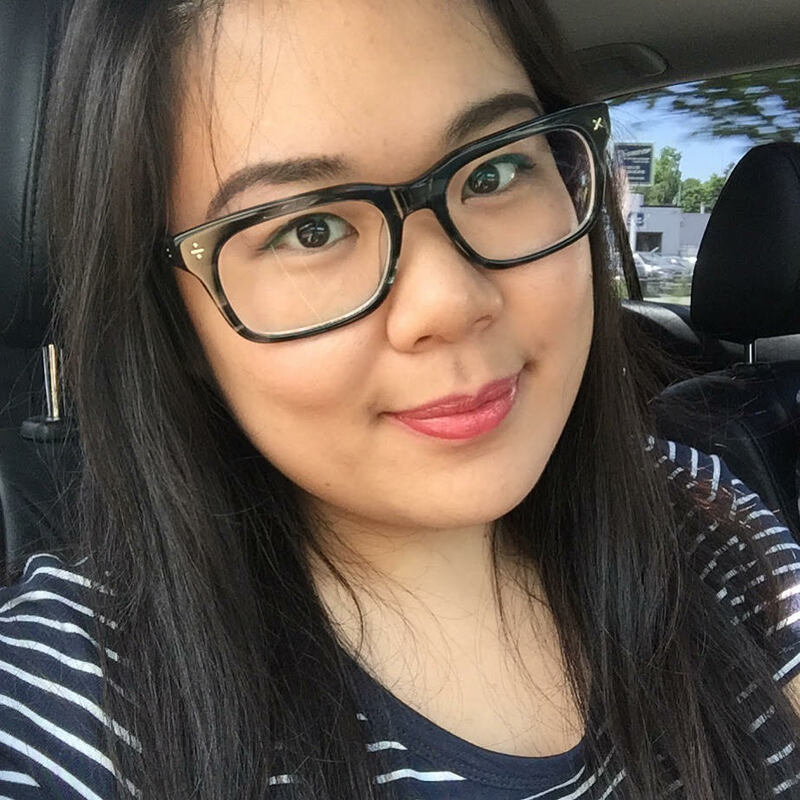 The foundation applied very easily and was pretty lightweight on my skin. The foundation is a light to medium finish, depending on how much you put on as it is very, very buildable! On some days, I used this for a light finish but on days where I wanted more coverage, I simply applied a bit more. Afterwards, I used the bronzer to contour my face. 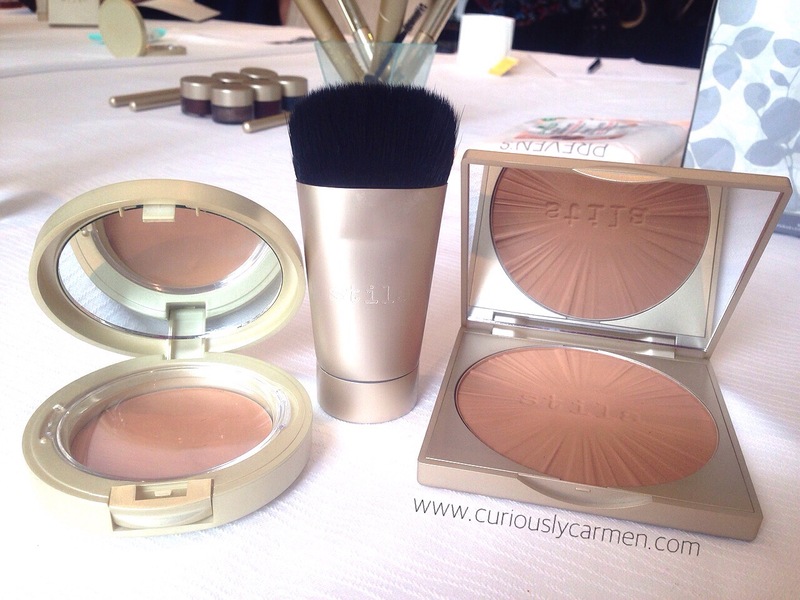 The bronzer goes on pretty light, which I prefer because I’ve owned some bronzers that look too harsh! Also, you can easily pick how much product you’d like, making this bronzer super buildable as well. For each cheek area, I swiped the brush three times in the bronzer. If you are new to contouring, I would recommend using this brush as you can easily put it on an angle and swipe bronzer on your face, then blend the product out. Since the brush is so dense, it delivers a nice and even colour on the first swipe. 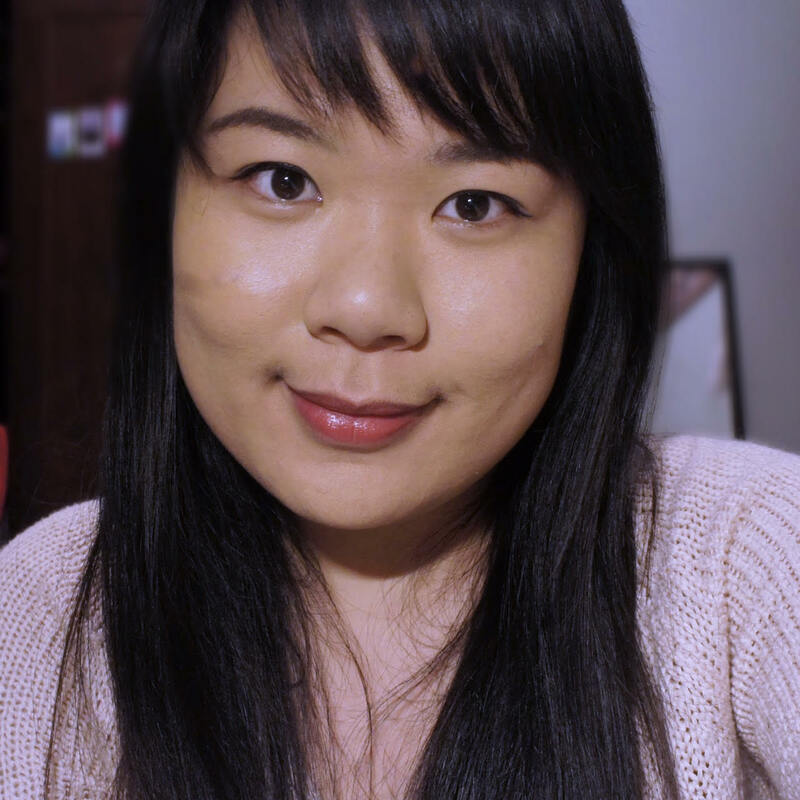 I always use primer before my foundation, but I decided to test these products out by eliminating it. After a whole day of shopping, I noticed that my foundation was still on but it was not as smooth looking as it initially was. As with most foundations and my slightly oily skin, I touched this up in the evening and it was as good as new! In conclusion, I really enjoyed incorporating these foundations into my routine and will be continuing to use them! I like how lightweight the two products felt, and how easy it was to apply and contour with the Wonder Brush. You could use these products daily, as they look very natural but you can easily build the coverage up if you would like! 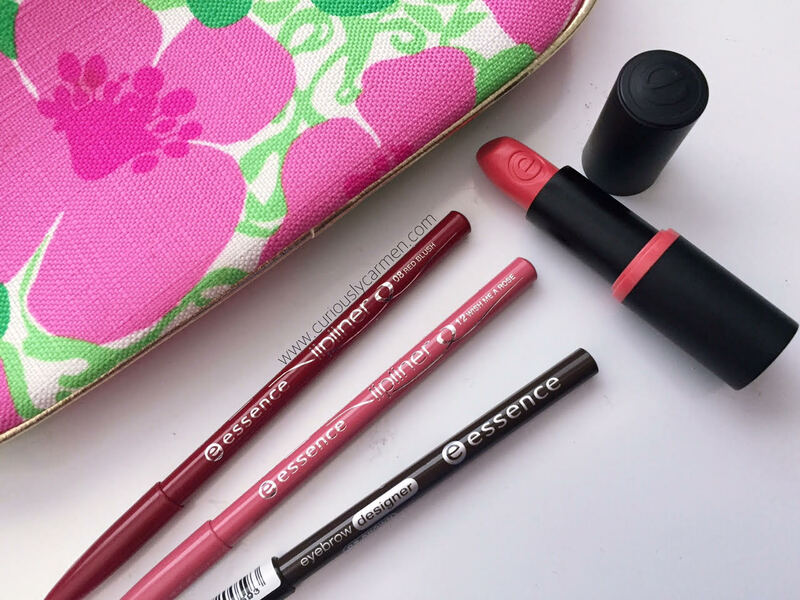 You can find these products at Shopper’s Drug Mart and Murale! 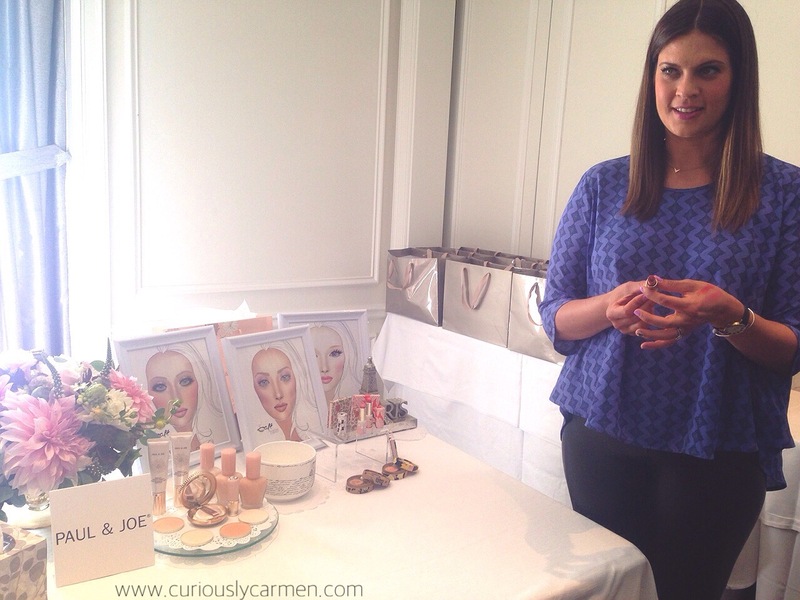 In early August, I was invited to the ACI Beauty event to experience their Fall/Holiday 2015 collection! I already mentioned this in part 1, but just in case you haven’t read that yet, ACI Beauty is one of the biggest beauty distributors in Canada. ACI Beauty works with many reputable beauty companies to help their products get on the shelves for us beauty lovers! At the event, we were guided throughout some of their newest products for next season. Welcome to part 2/2! I have seen some CLEAN products in Sephora before, but never had the chance to learn or test them out until that day. We got to smell some of the perfumes that day, and I enjoyed all of the different scents. If you’re someone who likes light and neutral scents, then this is the line for you. I had a few friends that came over and played with the samples, and all of them said that the perfumes smelled like ‘clean laundry’. I currently keep one of the rollerball minis in my purse,the light blue one in the middle of the box named ‘cool cotton’. It smells very refreshing and wakes me up a bit when I first put it on. The size is very convenient, and good to use on-the-go! 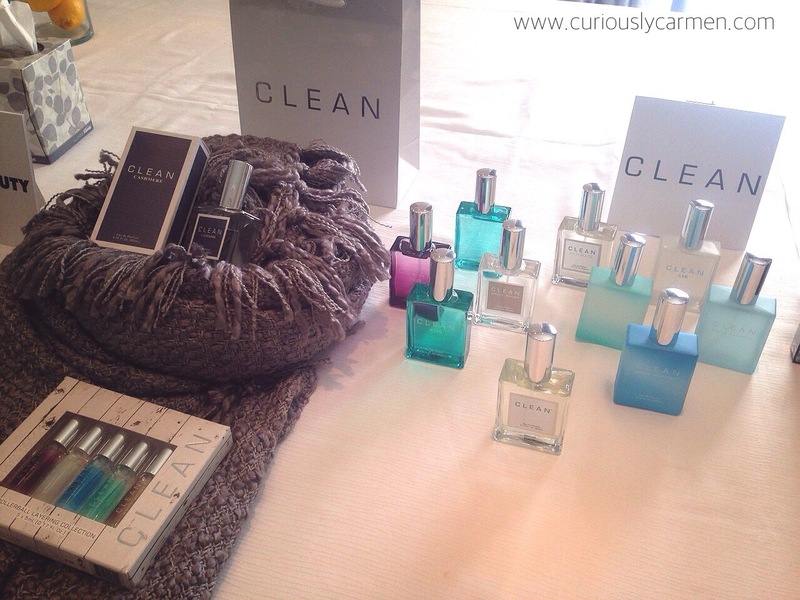 I also found that the CLEAN products are very gender neutral, maybe it’s just moi?? By that, I mean they don’t have a distinct ‘feminine’ or ‘masculine’ scent – it just smells like very clean soap! Although these products are catered towards women, I think that men would be able to wear this as well. This product was highly raved about with the ACI ladies, they use this almost every day at home! 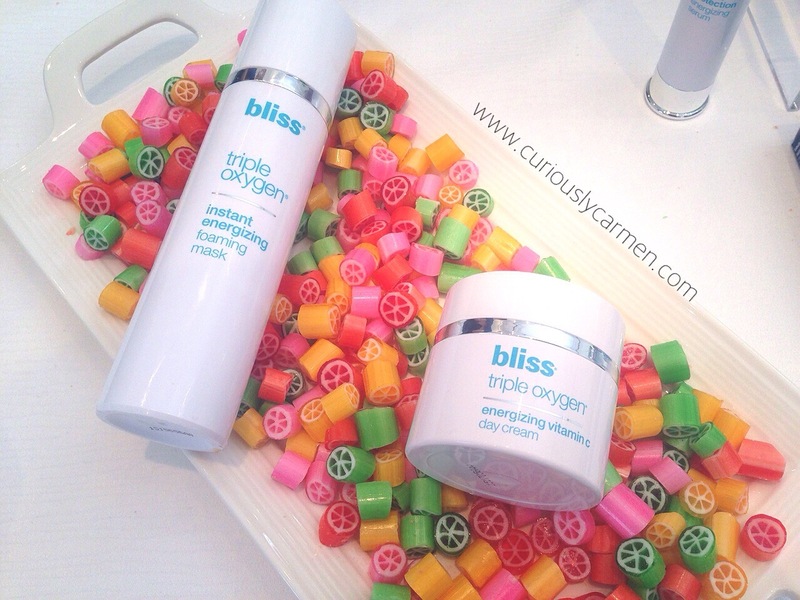 The Bliss triple oxygen instant energizing mask initially goes on your skin as a gel, but slowly turns into a foam as you rub it on your face. The foam expands on your face depending on much dirt or oil you have, so the foam size can vary each day. It also has a very nice grapefruit smell to it. Also, I love the candies in the background! I posted this on my Instagram already, but am I ever in love with this Paul and Joe lipstick! 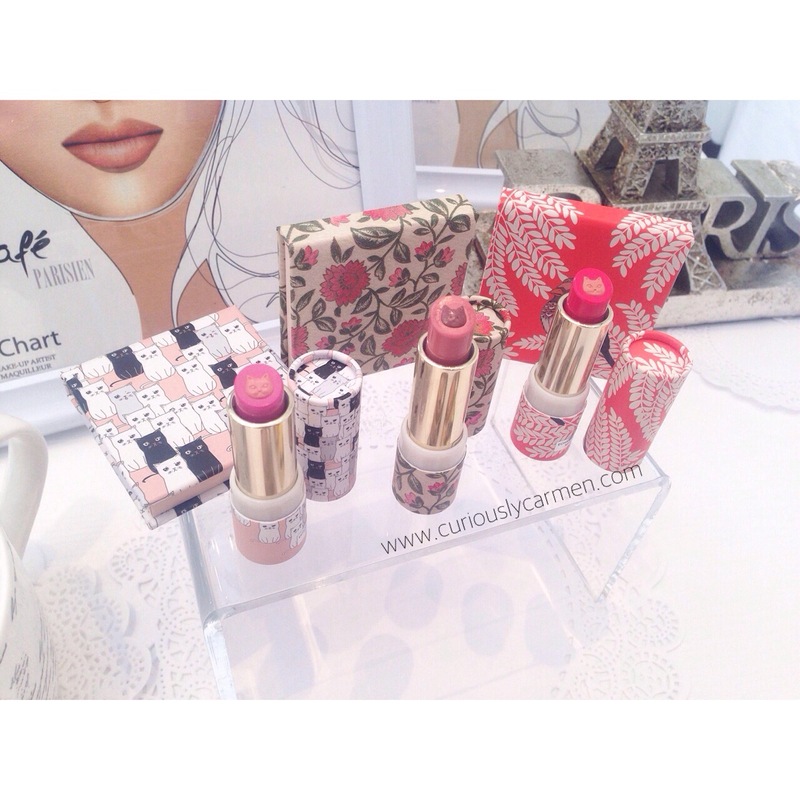 This lipstick is part of Paul and Joe’s Fall 2015 ‘Cafe Parisien’ line. To make this cute cat lipstick, Paul and Joe uses a Japanese candy-making technique called Kintaro-ame, which depends on two separate tubes – one columnar and one cat-shaped. This ensures that the cute cat faces remain visible until the lipstick is used up, so you don’t have to worry about the cute cat print going away! Also on the topic of lipstick, here are the new shades for Anna Sui. I called these the ‘shooting star’ lipstick because of the way the lipstick is shaped inside the tube! The colours are very rich and make a good transition for the Fall season. The Anna Sui loose powder, which comes in a new beautiful design, is pictured in the back. It comes with a fluffy purple puff, and looks so classic and elegant. I could picture a princess using this powder on her vanity table. Beside it is the Anna Sui BB Cream. I showed this picture in my Anna Sui nail colour review post already, but here are the new nail colours and a new bottle design! It features a birdie on the top of the brush, while the bottle has an intricate ball gown design to it. 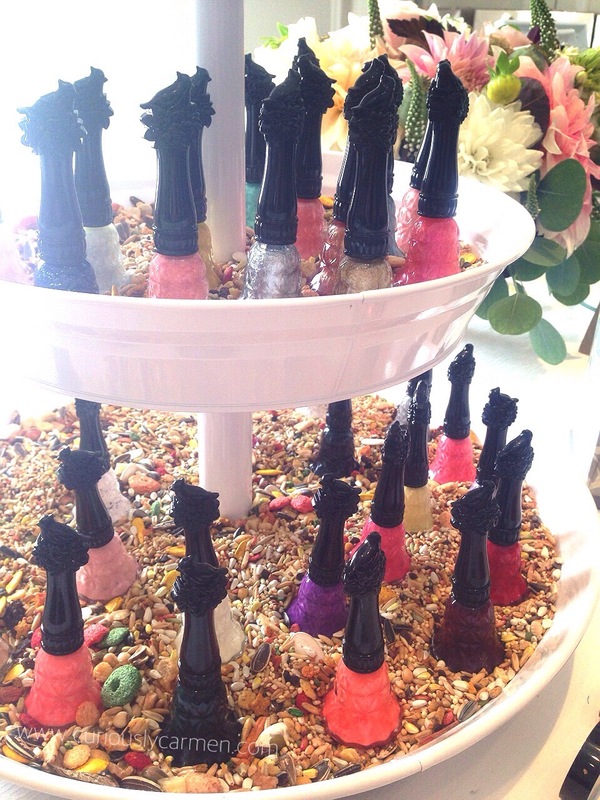 All of the Anna Sui nail products also have an amazing scent to them! The one I received smelled like lemons, and other scents include rose and lychee. 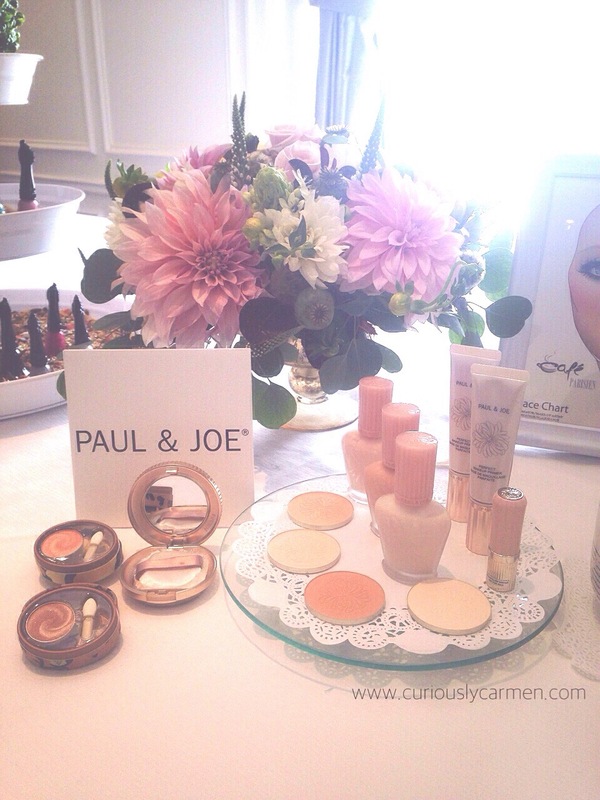 I also really adored the mini ‘latte’ eyeshadow pods that Paul & Joe had, featured on the left. The swirl and creaminess of the colours, coupled with a cute little foam tip brush is reminiscent of that a perfect, smooth latte on a chilly afternoon. I am a big fan of champagne/gold shades, so the eyeshadow pod is right up my alley. Also featured are the pressed powder pods, which are purchased separately from the packaging. Beside the pressed powder pods are the moisturizing foundation and makeup primer. The last station we were introduced to was Bliss’s regular collection (not the holiday gift set collection as featured in part 1). For myself, the most interesting product here was the ingrown eliminating pads, I am very curious to see if they will help with my ingrown hairs. I also did a review of the Bliss fabulous gel to oil cleanser, pictured in the middle beside the Fat Girl Slim products. You can read that post here. I had a great time at the ACI Beauty event, thank you for having me. I learned about a plethora of new products and am very excited to try them out! Keep your eyes posted for upcoming reviews on some of the products that I have mentioned here. Which product was your favourite from this post? Let me know in the comments!